Today, the Half Cent Coin remembers when the relatively new patent office awarded Eli Whitney a patent for his cotton gin. Though many others in that same time period developed similar versions of the cotton ginning process, Mr. Whitney gained the first patent. Efforts were made at a very early date in the cultivation of cotton in the South to improve upon the churka, and several roller ginning machines were invented; notably, in 1742, a French planter named Dubreuil invented one of the first machines for separating the seed from the fiber; in 1772, a somewhat similar one was constructed by a Mr. Cribs or Krebs, and a more practical gin was introduced from the Bahama Islands by Dr. Joseph Eve, of Augusta, Ga., about 1790. These roller gins, a modernized and improved application of the principles of the churka, proved admirably serviceable for the ginning of the long-stapled, smooth-seeded Sea Island cotton; but an immense problem confronted the planters of the inland states, that of harvesting and preparing for manufacturing purposes the prolific crops of short-stapled or Upland cotton. Necessity is ever the mother of invention, and when man’s need for certain things becomes imperative, ideas spring forth from various sources simultaneously, as though they had been hibernating in men’s minds, awaiting the crucial moment. So it was at this epoch of the culture of cotton in America. Hardly had Eli Whitney received a patent for his toothed-roller ginning machine, than Hodgen Holmes invented and received a patent for a gin necessarily similar in some respects to Whitney’s, but having toothed plates or circular saws revolving on a cylinder instead of the spiked wooden cylinder of Whitney. The honor of establishing the first practical and productive power gin in the world must be conceded to Hodgen Holmes. This gin was run by water in Fairfield county, South Carolina, by Mr. James Kincaid, in 1795. But we are pressing forward unduly fast. In 1792, Eli Whitney, a native of Massachusetts and a graduate of Yale College, travelled by boat to Savannah, Ga., intending to penetrate into the interior from that place in the hope of finding a position as a tutor, and thereby to obtain the means to follow the studies which would fit him for the profession of the law. On the boat he met Mrs. Nathaniel Greene, the widow of the American Revolutionary General of that name, and this lady invited him to make her house his home and take up his studies immediately. Whitney had evinced a taste and aptitude for mechanics from boyhood and he at once made himself useful in that direction about his patroness’ plantation. At this time, there was no method for cleaning the lint from the seed of the short-stapled, green-seeded Upland cotton but that of hand-picking, a pound of cleaned cotton being the result of one day’s labor of one woman; and the wearied slaves who had wrought all day in the cotton field were set to seed the cotton as their evening’s task. Whitney at once set to work, and the result of his experiments was a machine which successfully separated the large, woolly seed from the fiber of the Upland cotton. Whitney’s petition for a patent was filed with Thomas Jefferson, Secretary of State, June 20, 1793, and a patent was issued to Eli Whitney, March 14, 1794, signed by George Washington, President; Edmund Randolph, Secretary of State, and William Bradford, Attorney-General. This gin, in the documents filed at the patent office, and in the United States District Court, Savannah, Ga., is described as having a wooden cylinder into which were driven spikes or teeth of iron wire for the purpose of separating the lint from the seed. The patent issued to Hodgen Holmes, May 12, 1796, was signed by George Washington, President; Timothy Pickering, Secretary of State, and Charles Lee, Attorney-General, and was for an improved gin having circular saws fixed at regular intervals upon a cylinder which passed through spaces between ribs. Thus while Whitney’s invention of a gin consisting of a wooden cylinder, carrying annular rows of wire spikes, a slotted bar and a clearing brush was fundamental, the practical application of the fundamental idea was completed and carried out in a practical manner by Holmes’ invention of a gin with a shaft carrying circular saws, which passed through narrow spaces between ribs. Immediately upon the receipt of his patent, Whitney entered into partnership with Mr. Miller, of Savannah, in the manufacture of cotton gins. His idea was to own all the gins and to gin all the cotton produced in the country. Now, after the advent of the gin in 1794, a large crop of cotton was grown for the following season, the planters supposing that it could be prepared for the market by the new gins; but Whitney & Miller could not supply the demand, and, naturally, there was much infringement of the patent and many lawsuits in regard to it. When the heavy crops were ripening on the fields and the gins were not forthcoming, the planters had rough gins made in their own blacksmith shops. Whitney received from South Carolina, as the price of the State rights, $50,000; from North Carolina about $30,000, and from Tennessee about $10,000, his royalties in the Southern States thus amounting to $90,000, a very considerable sum in those days. In Georgia, priority of invention was claimed for a gin invented by Mr. Joseph Watkins, a planter of that State. His machine consisted in part of a wooden cylinder in which were inserted short spikes or teeth of iron wire, and Georgia refused to pay a royalty to Whitney, who, nevertheless, brought twenty-seven suits for infringement of his patent in Savannah, Ga.; of these, a decree for perpetual injunction was issued against Arthur Fort and John Powell; a verdict was granted against Charles Gachel for $1500 and against Isaiah Carter for $2000; judgment in default was allowed in one case; in two cases there was a verdict for the defendant, and the rest of the actions were non suited or dismissed. Whether the saw-gin was due wholly to the inventive genius of Whitney or of Holmes, or whether the machine is partially the work of each, is a moot point today. The time was ripe for the invention of the saw-gin, it was brought into being and completely revolutionized the cotton manufacturing trade of America and of Great Britain, and built up the Southern States on a basis of agricultural prosperity. In 1792, the amount of cotton marketed was 63,000 bales, of 500 pounds weight each. In 1796, when the saw gin had been in use for barely three years, the amount was 200,000 bales, which, in the year 1909, had risen to the amount of 9,436,400 bales. Various modifications have from time to time been made in the saw gin, but none have proved of any commercial value, and the fundamental working principles of the modern saw-gin are the same as when patented by Whitney and Holmes; perhaps it inclines rather more to the Holmes’ model, for the operation of Whitney’s gin was intermittent; when one breast full was ginned, the operation was suspended in order that the seed might be let out. The Holmes gin worked continuously, the improved form of the breast enabling it to make and carry a revolving roll of cotton, the seed dropping out as the roll of cotton revolved in the breast. 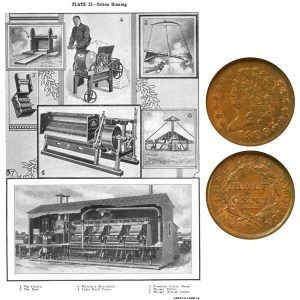 The Half Cent Coin shows with images of the early cotton ginning processes.